The girl is Hyong-yi (played by Kim Goeun), and she’s soon to learn that she has been raised to fulfill a mission: assassinate the two people who years before murdered who parents. Her father was part of a trio of heroes, two men and a woman. 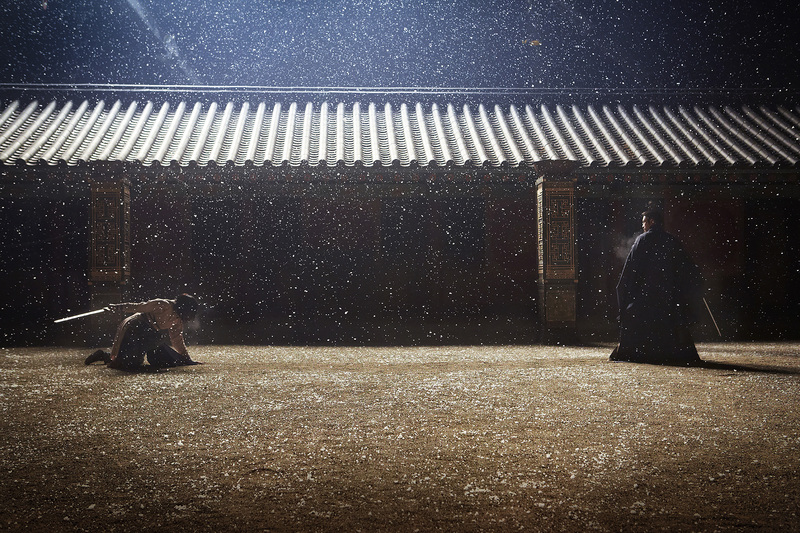 The other man betrayed them to the evil government forces (the film is set in the Goryeo era, sometime between 900 and 1400) and, desperately in love with the betrayer, the women anguishedly joined him and killed Hyong-yi’s father. That woman, now a blind tea-maker, also happens to be the woman Hyong-yi thinks is her mother, and it is she who has trained her in martial arts and assigned her her quest. The villain is now a high-ranking general, with imperial ambitions, and as Hyong-yi’s quest plays out, the story becomes more and more similar to the original Star Wars trilogy, which I have to say was an unexpected and certainly welcome development. But as the plot twists upon itself it becomes increasingly at odds with the very tasteful surroundings. That incongruity is interesting in itself, but the movie would have been a lot more fun if it gave into to its dementia and wasn’t quite so picturesque. The action exemplifies some of the best and worst trends in the modern wuxia film. The opening fight sequences are the worst, an blur of stuttering editing and fast and slow motion that simply hacks the stunt performers’ work to pieces. The first fights (in a combat pit Hyong-yi ventures into to show off her skills early on) are so bad I almost gave up on the film altogether. While digital technology has done wonders for the appearance of martial arts films, with vivid color corrections, magically-erased wires and seamless manipulation of the speed of motion, it can tend to turn the action into a gray, inhumane mush. Pretty, but lifeless. It does get better as the film moves along, as Park slows down the editing and makes use of a slow-motion/fast-motion/slow-motion pattern that brings out the elegance of the actors’ movements and their costumes. But this is first and foremost a tragic melodrama, the action is secondary. It is milieu, not driving force. As the film comes to its grim and inevitably bloody conclusion, including one of the more messed-up family hugs in film history, the lush music swells and the CGI snow falls but all I wanted were some shock zooms and a syrupy arterial spray. Memories of the Sword is now playing at the Century Federal Way Cinemas.